July 11, 2017: The Animal Legal Defense Fund Sues USDA for Denying Tony the Tiger is an “Individual” Protected by FOIA – The Animal Legal Defense Fund filed a lawsuit against the United States Department of Agriculture for refusing to recognize a captive tiger as an “individual” whose physical safety is at risk and refusing to expedite the organization’s public records request. June 6, 2017: The Animal Legal Defense Fund filed a motion to expedite the hearing, arguing that – due to Tony’s health – he would not be forced to wait until August 21, 2017. Summary judgement hearing is schedule for August 21, 2017. May 24, 2017: After a request for expedited processing of its Freedom of Information Act (FOIA) is denied, the Animal Legal Defense Fund files an administrative appeal arguing that Tony, and all animals, qualify as individuals under the act. May 18, 2017: The Animal Legal Defense Fund files a motion for summary judgement to free Tony once and for all. May 4, 2017: The Animal Legal Defense Fund files a Freedom of Information Act (FOIA) request for the U.S. Department of Agriculture inspection report from the evaluation the organization requested for Tony on April 1,2017. The organization requests expedited processing due to Tony’s status. April 1, 2017: The Animal Legal Defense Fund submits a letter to the U.S. Department of Agriculture requesting an inspection of Tony, based on recent information raising concerns regarding the tiger’s health. The letter urges the USDA to investigate potential Animal Welfare Act violations and determine whether Tony’s medical condition requires immediate independent veterinary care and treatment. March 28, 2017: The Animal Legal Defense Fund files an amended petition to intervene in an ongoing lawsuit against the state of Louisiana to defend Louisiana’s big cat ban and ensure Michael Sandlin cannot get more tigers. May 8, 2015: 4th graders at Guilmette Elementary School in Massachusetts were so moved by Tony’s plight that they created posters, circulated petitions, and wrote letters to Louisiana Governor Bobby Jindal urging him to move Tony to a sanctuary. Update: May 30, 2014: The Louisiana State House PASSED SB 250 by a vote of 67 YEAS to 26 NAYS. The bill now goes to Governor Bobby Jindal for consideration. Update: May 28, 2014: The Louisiana Natural Resources and Environment Committee PASSED SB 250 by a vote of 10 YEAS to 6 NAYS. The bill is scheduled for House floor debate on Friday May 30, 2014. Update: February 19, 2013 by Animal Legal Defense Fund: Attorneys for ALDF were in court on the morning of February 19, 2013 in Baton Rouge to defend our most recent victory, in which a district court judge ordered the Department of Wildlife and Fisheries to revoke the permit that allows Michael Sandlin to hold Tony the Tiger in captivity. ALDF lawyers told the three-judge panel of the Court of Appeal that the Department should never have issued a captive wildlife permit to Michael Sandlin, the owner of the Tiger Truck Stop. The judges listened attentively to arguments from all sides, and are expected to issue their opinion in Spring of 2013. We will update our supporters as soon as we know their decision. Update: January 24, 2013 by Animal Legal Defense Fund:On Tuesday, February 19, 2013 the courts will hear ALDF’s oral arguments in the appeal to free Tony. Note: There has still been no decision from the August 6th, 2012 hearing. We will post updates when they become available. Thanks for your continued support of Tony. Update: June 27, 2012: From The Animal Legal Defense Fund: There is a hearing set for August 6 in Sandlin’s lawsuit against the State; the court will hear ALDF’s and the State’s exceptions, which seek to have Sandlin’s case dismissed. If we succeed, Sandlin may appeal. If we lose, the case will proceed to the preliminary injunction stage. Sandlin’s appeal of our original law suit finally got a briefing schedule, so we’re expecting Sandlin’s opening brief in early July, with our response due later in July. No oral argument date has been set yet. Update May 7, 2012: From The Animal Legal Defense Find: Good news! In today’s hearing in Baton Rouge, District Judge Janice Clark agreed that the Animal Legal Defense Fund and two Louisiana residents can be parties to the lawsuit filed by Michael Sandlin, owner of Grosse Tete’s Tiger Truck Stop, against the Louisiana Department of Wildlife and Fisheries. ALDF and the other interveners seek to defend the state’s law banning private ownership of big cats. Thanks to today’s ruling, ALDF will now have a right to participate in all steps of the litigation as it moves forward. Update May 3, 2012: In today’s hearing in Baton Rouge, the judge ruled ALDF’s plaintiffs lacked standing in our lawsuit to force the Louisiana Department of Wildlife and Fisheries to do its job of enforcing Louisiana’s big cat ban now that the Tiger Truck Stop and Michael Sandlin are keeping Tony the tiger without a permit, in open violation of state law. The judge also ruled that department has discretion whether or not to enforce Louisiana’s law banning private ownership of big cats at this time. Over 50,000 of Tony’s supporter have signed an ALDF petition to the Louisiana Department of Wildlife and Fisheries over the past year, urging them to do their job—we’re all getting tired of waiting for the department to do the job it’s supposed to do and protect the best interests of both Tony and the public. Today’s decision in no way affects the judge’s ruling that Michael Sandlin and the Tiger Truck Stop cannot be granted a permit to keep Tony. We fully expect that once all the legal proceedings relating to this case have wrapped up, the Department will do the job it is supposed to do and make sure Tony is no longer displayed without a permit. We are considering our options for appeal in today’s decision, and we are continuing to fight Michael Sandlin’s attempts to delay the inevitable day when Tony will finally go to a suitable forever home at a sanctuary where he can live out his days as a tiger should. Update May 2, 2012: via The Animal Legal Defense Fund: Two hearings are scheduled for the coming week in the ongoing case of Tony, the eleven-year-old Siberian-Bengal tiger kept at Grosse Tete’s Tiger Truck Stop. On Thursday, May 3, the court will consider the Animal Legal Defense Fund’s most recent lawsuit against the Louisiana Departnent of Wildlife and Fisheries (LDWF). The lawsuit, filed on April 5, seeks to force LDWF to do its job of enforcing Louisiana’s big cat ban now that the Tiger Truck Stop and Michael Sandlin are keeping Tony without a permit, in open violation of state law. On Monday, May 7, the court will hear ALDF’s petition to intervene in the lawsuit filed by the Tiger Truck Stop and its owner Michael Sandlin against the state of Louisiana. Their case argues that Louisiana’s ban on private ownership of big cats like Tony is unconstitutional—flying in the face of the current national sentiment that dangerous exotic animals should be more strictly regulated. ALDF’s petition in intervention supports Louisiana’s power to safeguard public safety and animal welfare through such legislative measures. An ALDF representative will be testifying at the hearing. UPDATE: January 30, 2012 via The Animal Legal Defense Fund: Last Monday, Judge Caldwell denied a motion brought by Michael Sandlin and the Tiger Truck Stop (TTS) that sought to suspend Judge Caldwell’s order while Sandlin and TTS appealed. In other words, Tony would have stayed put at the truck stop until after the appeal ran its course, which could take months. Instead, Judge Caldwell’s order instructing the Department to revoke the permit will go into effect right away. Sadly, this does not necessarily mean Tony is leaving the truck stop soon. Sandlin has filed his own lawsuit against the Department, which has been temporarily restrained from taking any action to remove Tony. Our attorneys are doing everything they can to resolve these conflicting orders to make sure Tony makes his way to a humane, accredited sanctuary as soon as possible. “We are confident that the state of Louisiana and the Department of Wildlife and Fisheries acted well within their legal authority when they decided to protect both the public and big cats like Tony by restricting private ownership of wild animals,’’ he said. UPDATE: December 12, 2011: State District Judge Mike Caldwell denied Tuesday a motion for a new trial filed on behalf of Michael Sandlin, owner of Tiger Truck Stop Inc. near Interstate 10 in Iberville Parish. ALDF is well-aware of the allegations of horrendous conditions at G.W. Exotic Animal Park. Our attorneys are researching various legal strategies for ensuring that Tony goes to a reputable sanctuary, not a roadside zoo. UPDATE: December 5, 2011: Both Mr. Sandlin and The Louisiana Department of Wildlife and Fisheries have filed motions for a new trial. Sandlin’s motion basically re-argues everythingJudge R. Michael Caldwell has already decided. LDWF’s motion focuses only on the award of costs to the plaintiffs and is not contesting the decision. A hearing date is pending and any further information will be posted when it becomes available. Please continue to support Tony: https://freetonythetiger.wordpress.com/2011/11/21/stay-strong-tony-recent-pics-of-tony/ Thank You. UPDATE: November 4, 2011: Recent Facebook posts from The Animal Legal Defense Fund concerning the decision on Wednesday November 2, 2011 for Tony. UPDATE: November 2, 2011: VICTORY FOR TONY! Court Rules Current Permit Must Be Revoked Great news from Baton Rouge, where Judge Michael Caldwell has ruled in favor of the Animal Legal Defense Fund and Louisiana taxpayers in our lawsuit to free Tony the Tiger from the Tiger Truck Stop in Grosse Tete, Louisiana. UPDATE: October 7, 2011: The exception hearing on October 17th is rescheduled to November 2nd when the court will also hear The Animal Legal Defense Fund ‘s motion for a permanent injunction to revoke the permit which allows Mr. Sandlin to keep Tony at the truck stop. UPDATE: September 20, 2011: Via The Animal Legal Defense Fund: The court has scheduled two new hearings in the Tony the Tiger case. On October 17th, the court will hear the State’s exceptions, which challenge the plaintiffs’ standing to bring the case. On November 2nd, the court will hear ALDF’s motion for a permanent injunction to revoke the permit that lets Michael Sandlin confine Tony at the Tiger Truck Stop. UPDATE: On August 15, lawyers for ALDF will be in court in Baton Rouge to defend against Michael Sandlin’s, attempt to get the case dismissed. The Court has also set a hearing date of September 15 for ALDF’s motion for a mandatory injunction, which seeks an immediate revocation of Sandlin’s permit to keep Tony. UPDATE: July 18 2011: The hearing scheduled for July 22, 2011 has been postponed. More information will be posted when available. UPDATE: June 28 2011: A hearing is now scheduled for July 22. Please continue to support Tony by signing his petitions and voicing your concern for him. Petition links and information on actions you can take for Tony: https://freetonythetiger.wordpress.com/2011/06/18/your-continued-support-for-tony-is-needed/ Thank you. UPDATE: June 14, 2011: The hearing scheduled for June 14 has been postponed to a later date yet to be determined. The hearing was continued to provide the Department an opportunity to conduct discovery, an essential stage of the litigation process. 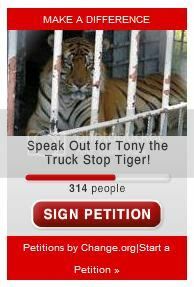 UPDATE: June 3, 2011: Next Steps in ALDF’s Fight to Free Tony the Truck Stop Tiger http://www.aldf.org/article.php?id=1723 A new hearing on the motion for a mandatory injunction has been set for June 14. 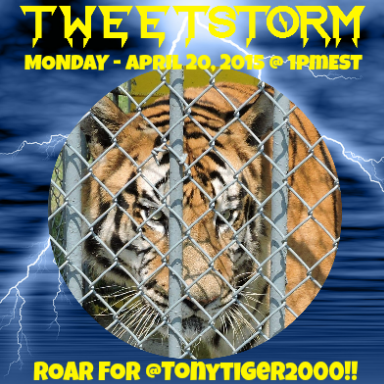 UPDATE: May 26, 2011: Please see this post: https://freetonythetiger.wordpress.com/2011/05/26/important-roar-on-for-tony/for actions you can take to continue showing your support of Tony. While the decision by Judge Caldwell in granting a permanent injuction barring the renewal of another permit to Mr. Sandlin is a positive action for Tony, we must continue advocating for the current permit to be revoked immediately. Please sign the petition if you haven’t already and share the link. The stench of fuel. The deafening sound of diesel engines. The neverending boredom of captivity and isolation. Such are the conditions in which Tony, a 10-year-old Siberian-Bengal tiger, has spent every day and night of the last decade at the Tiger Truck Stop in Grosse Tete, Louisiana. 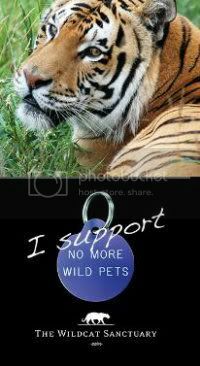 It’s no life for a tiger, or any other animal. That’s why the Animal Legal Defense Fund has filed a lawsuit in Louisiana, arguing that the permit that allows Tony to languish in a roadside cage violates state law. Kristin Bauer, the actress who portrays the lovely-but-lethal vampire Pam on HBO’s award-winning True Blood, has teamed with the Animal Legal Defense Fund in the fight to free Tony. In addition to being subjected to noise and diesel fumes 24-hours a day, Tony is also frequently harassed and taunted by visitors at the truck stop. His enclosure is devoid of adequate enrichment, such as logs, trees, or complex vegetation that would allow him to engage in natural tiger behaviors. He has no pool of water large enough to allow him to submerge himself to cool off in the blazing heat of the summer. As a result of the stress of his confinement, Tony constantly paces on the hard concrete surface of his enclosure, putting him at risk for dangerous and painful veterinary conditions. Michael Sandlin, the owner of Tony and the truck stop, has been cited by the USDA due to violations of the Animal Welfare Act, including a lack of proper sanitation and improper feeding practices. Year after year of living at the Tiger Truck Stop have taken their toll on Tony’s health. The ambient noise from the nearby freeway and the idling trucks, their diesel engines spewing noxious fumes directly into his enclosure, is painful and obtrusive to an animal with such sensitive hearing and an acute sense of smell, says veterinarian Jennifer Conrad, who has 16 years of experience with captive large cats and has visited Tony. “Based on what I have observed of Tony’s enclosure at the Tiger Truck Stop and his behavior from video and photographs, it is my professional opinion that this tiger is in poor condition and needs intervention on his behalf,” she says. 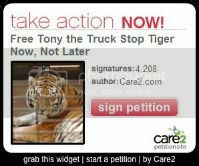 On April 11, 2011, ALDF filed a lawsuit against the Louisiana Department of Wildlife and Fisheries (LDWF) and its secretary Robert Barham, arguing that he violated state law in granting a permit allowing Sandlin to exhibit Tony at the Tiger Truck Stop. Joining ALDF as a co-plaintiff in the case is former Louisiana Representative Warren Triche, who authored the state’s law which led to the ban on the private ownership of tigers. Two other Louisiana residents, also deeply concerned by Tony’s long-time suffering, are additional co-plaintiffs. At the heart of ALDF’s position is the fact that Sandlin’s current housing of Tony violates state and local laws. In 2006, the Louisiana state legislature unanimously passed Act 715, which required LDWF to control the private ownership of big cats. The department enacted regulations prohibiting citizens from keeping a tiger as a pet or exhibiting a tiger in the state. In passing these regulations, the department rightly declared that possession of big cats and certain other exotic animals poses significant hazards to public safety and health and is detrimental to the welfare of the animals. The regulations provided an exception, however: individuals who legally owned big cats as of August 15, 2006, were grandfathered in. These owners would need to apply for an annual permit from the LDWF. An ordinance passed in Sandlin’s parish of Iberville in 1993 made it illegal for anyone to keep a tiger or other large exotic cat on his or her premises for exhibition. In other words, Sandlin did not qualify for the exception because he was not in legal possession of Tony. In addition, Sandlin is ineligible for the state’s grandfathering provision because he does not live on the premises where Tony is kept, contrary to regulations. Despite the fact that Sandlin was ineligible for a grandfather permit, the LDWF nonetheless issued him one. ALDF is taking the department to court to invalidate this illegally-issued permit.—and free Tony from his troubled life at the truck stop. Join the Animal Legal Defense Fund in urging the state of Louisiana to revoke the permit that allows Tony to be kept at the Tiger Truck Stop—a permit that violates both state and local ordinances designed to protect people and wild animals like Tony. Sign the petition to the Louisiana Department of Wildlife and Fisheries now!